Critics say giving police control over when they turn on their body cameras makes the devices less effective. Police in Melbourne have started using body cameras as part of state-wide rollout expected to be complete by 2020. Victoria’s government and police force says the cameras improve accountability, and help “de-escalate violence in interactions between the police and criminals”. “Police will be turning the cameras on whenever they are exercising police powers, collecting evidence or when it would provide transparency to a police interaction,” Victorian police commander Russell Barrett said this week. Police who do not turn on the cameras “will have to indicate why they haven’t activated”, says Police Minister Lisa Neville. 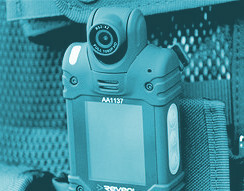 The authorities say officers will face punishment “on a case-by-case basis” for not turning on the cameras, and no word has been given on what kind of sanctions they would face if they do. But Victoria’s rules appear to be stricter than NSW’s, where officers can “activate the record function of the camera at their discretion”. “Generally this will be incident-specific or to capture something of relevance,” NSW’s guidelines state. Greens MP David Shoebridge says both Victoria and NSW should follow the example of some US states that require officers to have the cameras on whenever they are in public. “It’s the moments when police don’t want to be recorded that are often the most important,” he told reporters.